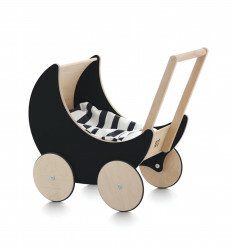 A little wooden pram for all of the favourite dolls is now available with blackboard sides. Our Black Toy Pram is just too cute for words. It is made entirely of wood, with the exception of the tiny tires on the wheels. It is extremely appropriate for all of the dolls, including stuffed toys and the favourite teddy bear. Add a tiny blanket and pillow, and you have yourself a cutest little bed on wheels ever seen. Wipe the blackboards size clean of chalk with a damp cloth. Wipe any dirt or spills from the rest of the toy pram with a damp cloth. This will remove grime from general use. Tougher stains like food or colour may be difficult to remove. The blackboard sides are only meant for use with chalk, not with marker or pencils. The ooh noo Toy Pram is a wooden toy and is not intended as a baby walker. Likewise, it is not intended to carry loads of more than 2 kg (4,5 lbs).